I am always on the look-out for cute and easy projects on Pinterest (>>follow me here<<). 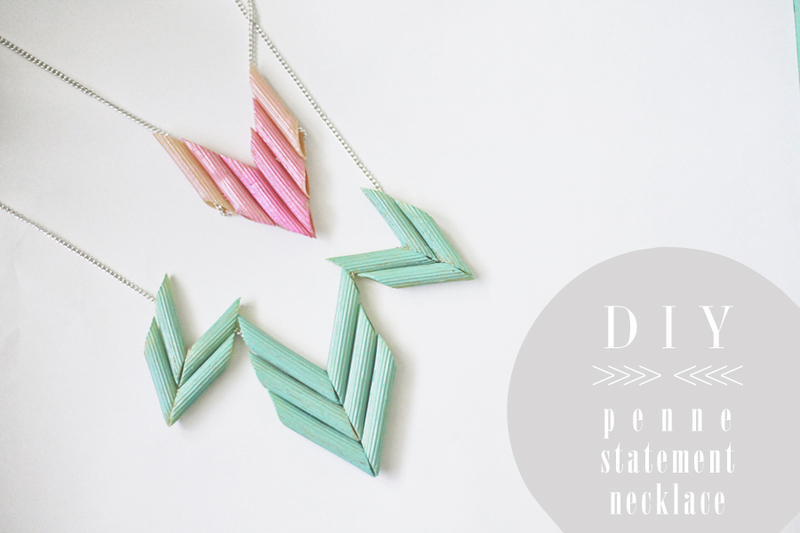 I came across this tutorial on how to make a statement necklace with penne pasta, I decided to give it a try...with my own little spin, of course. 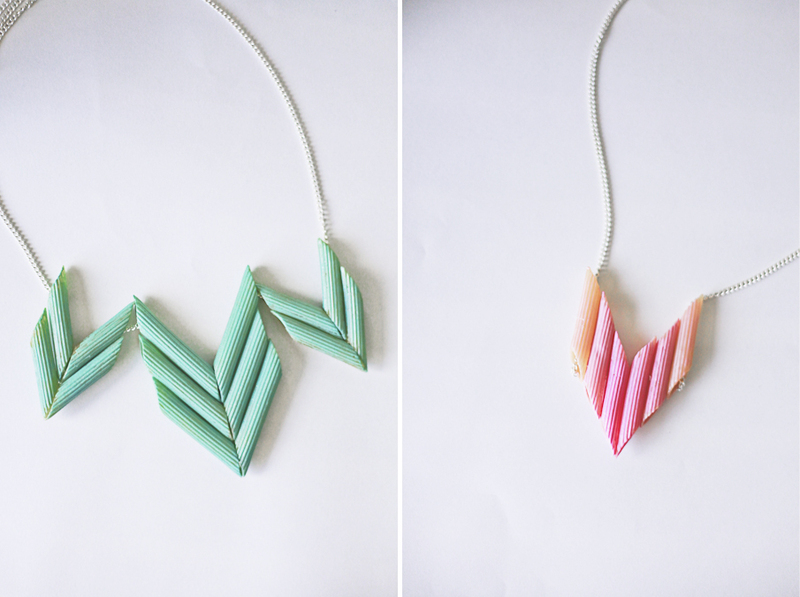 This project totally brought me back to the elementary school days, making macaroni necklaces to give to the mothers for mother's day -- this is the more sophisticated, totally wearable version! I took the inspiration from pinterest and came up with the aqua statement piece. Using nail polish instead of paint, gives it a shinier finish, and less pasta makes a less bulky piece of jewelry. The pink ombre one is completely my own -- I liked the idea of using the penne vertical, giving it a completely different look. The problem with this design was that the chain couldn't go through the top pieces, but I think it worked out okay by stringing it through the end ones. Which one is your favorite?? The pink one is a little more my style. 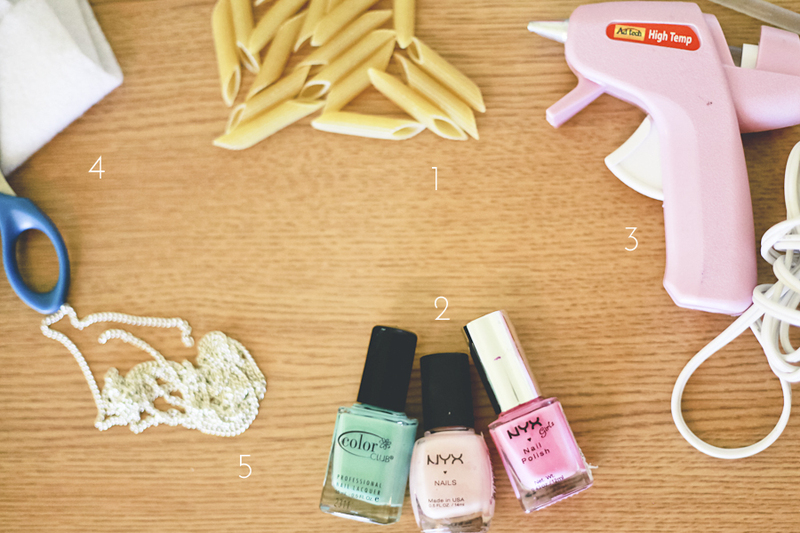 Choose 6 pc (for the ombre) and 14 pc (for the larger necklace) of penne. Choose carefully, because not all pastas are made equal. Once you have the pasta, paint each one with the nail polish of your choice. I used 2 coats of green on each pasta for the larger necklace. For the ombre, I used 2 coats of light pink on two pieces, 2 coats of dark pink on another two pieces, and 1 coat of each, light over the dark, on the last two penne. While the pasta dries, cut the felt into the hanger shapes for the backing (this is optional). Once dry, lay the pasta pieces down in the shape and design you want. Apply glue to only the back side, carefully gluing each piece to the other. (Then glue the felt backing - or if not using felt, use generous amount of hot glue to coat the back side). String the simple chain necklace through the hanger pieces, and voila! your new statement piece. Do you want to see more DIYs/tutorials? Be sure to follow the blog, and leave some comment love!